Since 2013 when first presented, my CODER algorithm has been one of the most accessed posts on www.Hubaisms.com. Recently it has been “rediscovered” and is now being accessed frequently. So I decided that I should take a look at it and see if it needed to be upgraded. 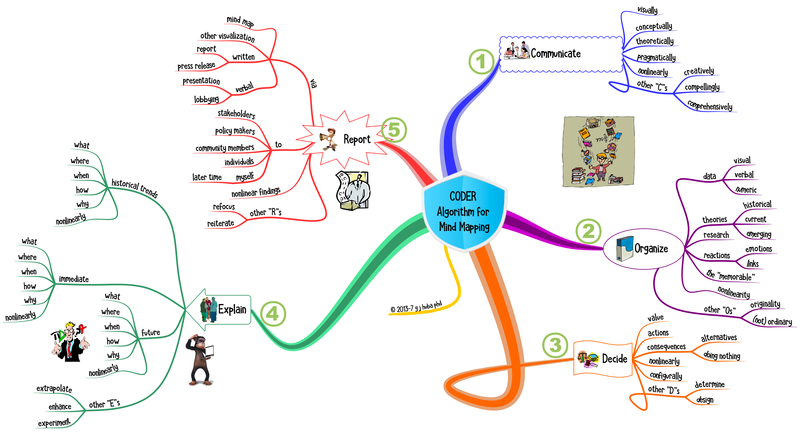 In fact, I discovered that my views were about the same on how to develop a meaningful and informative mind map. Consequently, I just made a few very small and largely inconsequential content changes to the map. The map has been reformatted. The program in which this was originally drawn (iMindMap) has been enhanced significantly and annually since 2013. The original mind map from 2013-2015 can be accessed HERE The original post includes textual material about the map. Drum roll, please. Here is the 2017 revision. Click the image to expand it.